The Germanic Kingdoms called emerged after the fall of the Western Roman Empire from the great migrations of "barbaric" Germans who settled in various parts of the former empire. The Roman Empire suffered the entry into their borders peoples as Anglos, Burgundians, Franks, Lombards, Ostrogoths, Saxons, Swabians, Thuringians, Vandals, Visigoths, etc. These peoples merged with the Roman civilization and ended up creating more or less stable kingdoms beginning to forge Western civilization as we know it. They were organized in monarchies that initially were elective as a legacy of their former organization, but subsequently became hereditary. They had to choose between the option as a minority to dominate the majority of the Roman population, or mix socially with the people of the former empire. Goths and Vandals became the first track while the Visigoths chose the latter. They had to provide new laws and surround yourself with mainly Roman administration officials. The economy became rural, subsistence. Trade previously protected by the Empire practically stopped and had to be locally produce all that is needed. The cities began to decline and culture and the arts receded. The Germanic peoples, in the absence of another power as a partner, the Christian bishops used to establish relationships with the residents of the ancient empire. The bishops thus increased their power and prestige. 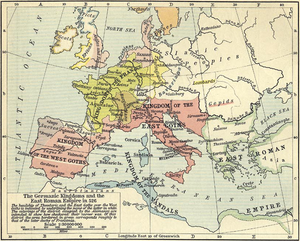 United Visigoth of Toulouse (Toulouse) (years 418 to 507). This page was last modified on 16 November 2015, at 00:45.